Winning the election of 1968, Nixon wanted to return the nation to conservative rule and go against the liberal movements going on around the country. He wanted to decrease the role of the federal government. 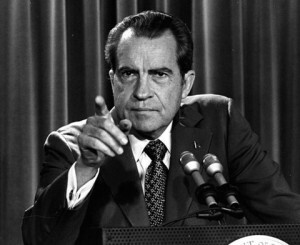 Nixon was concerned that government spending on social programs could damage the economy with high taxes. In an approach Nixon called New Federalism, he attempted to give more power to local and state governments and reduce spending on various social programs. Nixon also practiced revenue sharing. This meant the federal government did not restrict states on how to spend money. Yet, he tried to set limits on welfare payments and make unemployed recipients take job training courses as they looked for work. They had to accept any “reasonable” work offered to them or lose their benefits. Revenue sharing did come about. Yet, these changes to welfare and unemployment never passed the Senate. To achieve support from the Democrat controlled Congress, Nixon had to give in and fund several social programs. Ironically, Social Security, Medicare, and Medicaid payments increased under his leadership, despite his desire to reduce government spending. Nixon opposed the anti-war protest movement against the Vietnam War. He wanted to end the conflict, but did not support the liberal protest movements that seemed to disregard government leadership. He claimed there was a “silent majority” of middle class people who opposed the liberal “hippie” movements and the changing morals of the new generation. In Brown vs. Board of Education, the Supreme Court ruled racial segregation in schools was unconstitutional. This was a huge step to end the evil system of segregation. In Swann vs. Charlotte-Mecklenburg Board of Education, it was ruled that busses could be used to bring African Americans to traditionally white schools to help end segregation. Nixon tried to oppose this ruling. Many whites in the South did not support Civil Rights or the Great Society of President Johnson. Nixon wanted to slow desegregation efforts and cater to these voters. President Nixon tried to slow down integration in states like Mississippi. 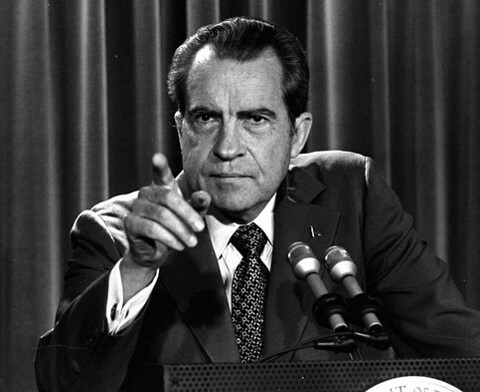 During Nixon’s presidency, the economy experienced stagnation, high inflation and high unemployment. Deficit spending and dependence on oil influenced this occurrence. The Organization of Petroleum Exporting Countries (OPEC) stopped selling oil to the USA because the USA supported Israel in the 1973 Yom Kippur War with Egypt. Many oil producing nations had Muslim populations that supported Egypt. Nixon’s aid, Henry Kissinger, helped manage foreign affairs. Kissinger practiced Realpolitik. This meant that the USA dealt with nations based on their power. In other words, the USA could not refuse to work with large nations simply because they were Communist. For years, the USA had refused to trade with China due to their Communist government. Yet, following Realpolitik, Nixon opened up a new relationship with China in the early 1970s. By the late 1970s, a formal relationship between China and the USA was established. In 1972, Nixon also traveled to Moscow to initiate a new relationship with the Soviet Union and discuss the Strategic Arms Limitation Talks to reduce nuclear weapons. Nixon had great accomplishments in foreign policy. Yet, Vietnam still loomed as a disastrous conflict that he would have to try and bring to a close.